Above: More storage space was found under a staircase in this Bend kitchen. The added cabinet also helped create more visual separation between the kitchen and other areas of the home. Families grow. Over the years, we accumulate stuff like furniture, appliances, and shelving, plus boxes of sentimental items that we just can’t bear to part with. At some point, it feels like there’s no more space for all of our things. But don’t fret. A lack of space can be easily solved with a few efficient upgrades. Sometimes, it’s not how big a space actually is, but how big it feels that makes a difference. For example, partial wall removals can really open up a space without the need for major structural changes. “If you have a wall dropped to waist level, it opens up visual lines in the space and helps it feel much bigger,” says Neil Kelly Design Consultant Magda Zafer. Placement is also important. In an open-plan kitchen, refrigerators, ovens and other tall appliances can be placed on a back wall, somewhere where they are not interrupting the flow of cabinets. “That can really help the room feel more spacious as well,” says Zafer. Additionally, using lighter colors, natural light and mirrors can provide the illusion of more space in the kitchen — or in any room, for that matter. Above: Floating shelves add storage to areas such as open walls and corners. Sure, there were code requirements, like clearance in front of the toilet or necessary headroom. “It was kind of like working with a puzzle — trying to fit all of these elements while making sure the room was up to code,” says Zafer. 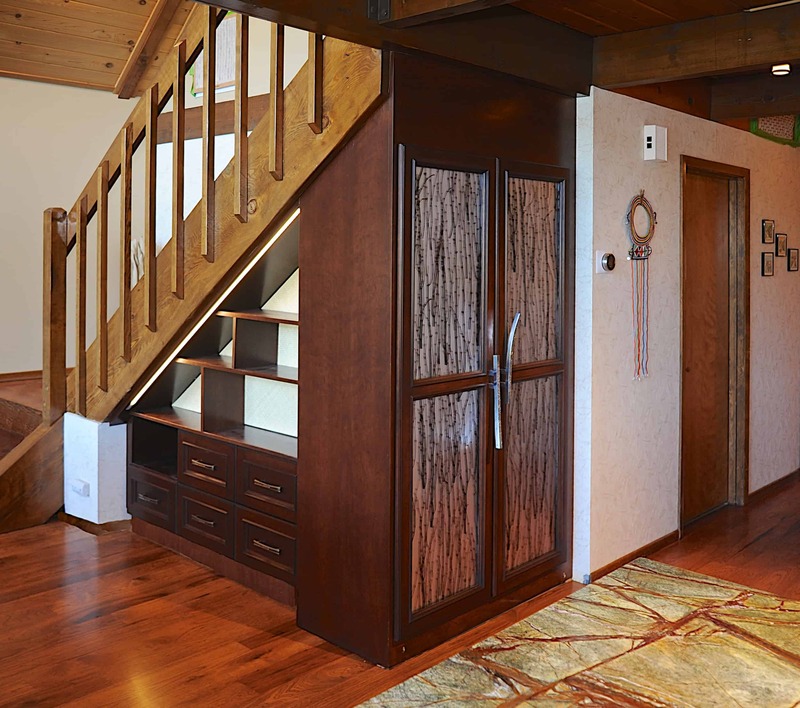 Alternatively, that unused space under your stairs could be turned into valuable storage. “This kind of concealed storage is perfect for things like luggage that are typically huge space wasters,” Zafer adds. 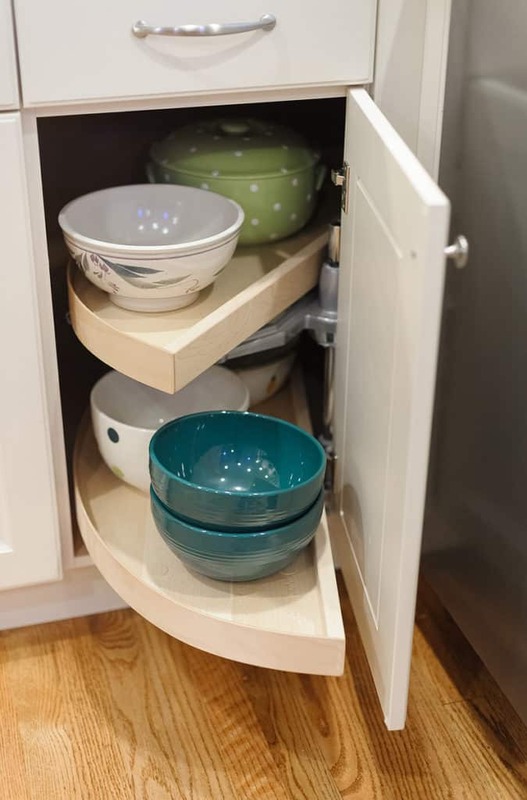 Above: Inserts like this cabinet pull out maximize storage and make it easier to reach items inside. In addition to hidden nooks for storage, you can create more storage space with niches and floating shelves. When designing for more space and storage, always make sure that everything has its place. It’s much more likely the space is going to be kept tidy and organized if you have a solid idea of where things belong. The easiest way to know where things belong is to make a list. 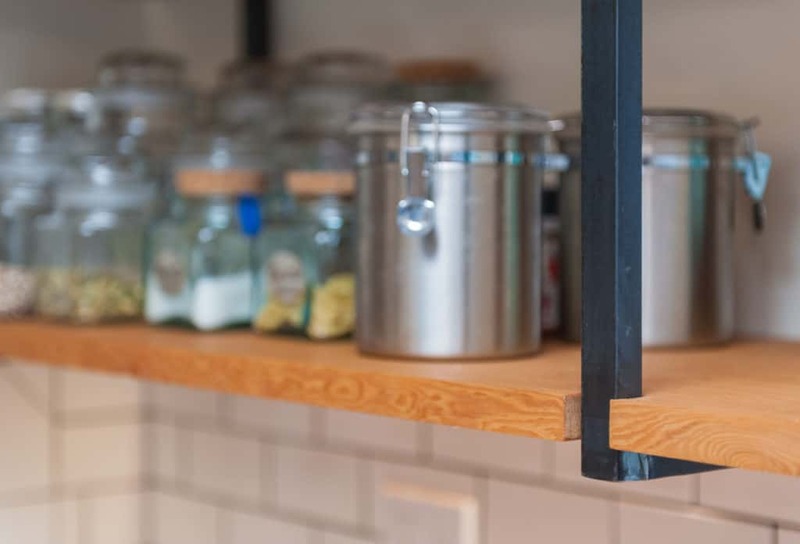 Whether you’re adding shelving to the bathroom or the kitchen, address what will go where ahead of time. That way, when the project is finally complete, your space will feel more organized and visually uncluttered. Tight quarters? Can’t move? Walls closing in? Let Neil Kelly find more room! We can open walls, help you plan for better use of space, and maybe even discover space you didn’t know existed. Get in touch!